"Even with corporate offices closer to the international airport, we transitioned to CGF and have experienced simpler access, short taxi times, and NO delays for arrivals / departures with our Citation X. This has translated into significant time and cost-savings. I want to thank the CJC Team for delivering prompt service with extra friendly care and attention to detail. You guys make it easy to request assistance with virtually any need." "We see our patrons not as customers, but as invited guests, and we are the hosts. It is our pleasure day in and day out to make every aspect of the customer experience seamless and memorable." 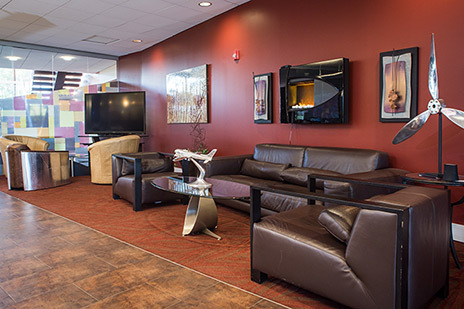 Located at Cuyahoga County Airport (KCGF), 12 miles east of downtown Cleveland, The Cleveland Jet Center offers a world-class service experience with the perfect blend of professionalism and charisma. Numerous corporate flight departments, charter companies, and owner-operators choose The Cleveland Jet Center and CGF due to its access to Fortune 500 companies located on the east side of Cleveland. 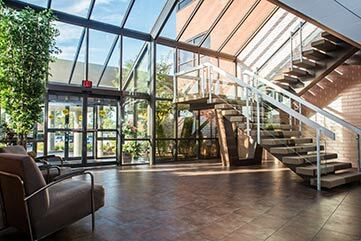 The airport’s close proximity to downtown allows our guests to avoid the congestion while still remaining close enough to enjoy everything the city has to offer. Whether providing dining options, arranging for entertainment, or simply handling your aviation needs, our team is prepared to serve from touchdown to takeoff as your Host to the Cleveland Experience! Preview our many luxurious amenities ranging from our private fitness center, aircraft detailing services, to our cafe and pilot lounge. Planning an upcoming visit to Cleveland? Conveniently schedule your reservation online and select from our many additional amenities. Pilots may find specific airport information including detailed runway and contact information for your upcoming visit.